Welcome! The Association of Professional-Technical Employees (APTE) is an employee association based on the college’s personnel classification system. 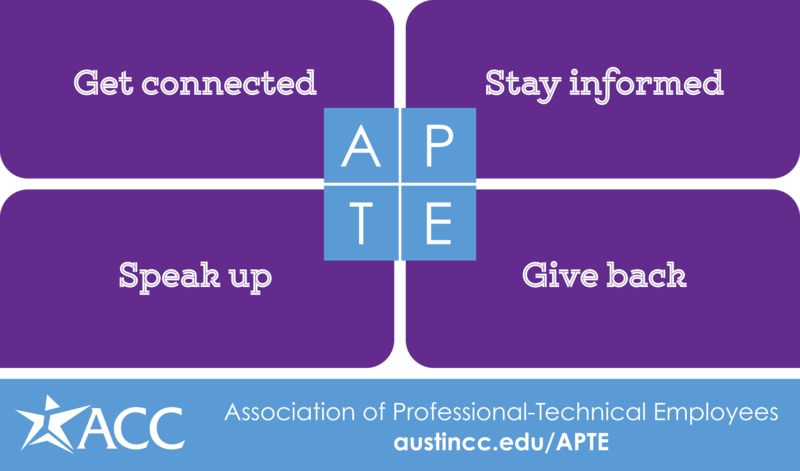 You become a member of APTE when you are hired as a professional-technical employee. The other employee associations at ACC are the Full-Time Faculty Senate, Adjunct Faculty Association, and Classified Employee Association. Providing leadership and support services to the professional-technical employees of ACC. The mission of APTE is to provide leadership and support services to the professional-technical employees of the college in order to facilitate ACC’s mission of promoting student success and improving communities. Participating in and coordinating activities in collaboration with local, state, and national higher educational organizations.